Jewish Funders Network CEO Andres Spokoiny. Over 550 funders and foundation professionals gathered in San Francisco this week for the Jewish Funders Network conference. The annual international gathering is a conference unlike any other in Jewish philanthropy. “It’s one of the few places in the Jewish world that does things very cutting-edge. It’s very special because there’s no party line, and it’s very innovative,” said Nancy Kaufman, CEO of the National Council of Jewish Women. Membership in JFN is limited to those who give direct grants of at least $25,000 each year “in the name of Jewish values,” according to its membership criteria. Foundations can be in the U.S. or anywhere worldwide. Attendees to this year’s conference came from nine countries, including Australia and Sweden, said Seth Chalmer, JFN’s communications director. It currently has about 1,800 members from over 430 charitable families and foundations in 11 countries. Collectively, according to JFN, they give $1 billion in funding each year. Kaufman’s organization, NCJW, is at the JFN table because it provides $150,000 in funding to Israeli women’s organizations advancing women’s leadership and social change, among them the pro-peace group Women Wage Peace and the transgender program at Jerusalem Open House, an organization serving the needs of the LGBTQ community there. Programming at the March 17-19 conference ran a wide gamut, from talks and discussions of “big think” issues like Jewish poverty, Israel-diaspora relations and the future of Zionism, to “technology and the Jewish future,” as the opening plenary was titled. “The people at the conference are really interesting and very diverse, from very large foundations to very small family foundations, but all people who are looking to do things in new ways,” said Kaufman. The Jewish community worldwide is at a critical juncture—more accurately, several junctures—said JFN president and CEO Andres Spokoiny in his conference address. He titled it “Looking Past the Flames,” alluding to the Biblical burning bush through which God spoke to Moses. Spokoiny urged his listeners to see past the flames of the crises that seem to emerge at an ever-hastening pace, and address longer-term, bigger-picture issues. In the Jewish world today, our attention is focused on the many fires we have to put out: from anti-Semitism to assimilation; from the breakdown of Israel-Diaspora relations to polarization in the Jewish community,” he said. “We have to ask the ‘why’ behind each of these phenomena… What are the overarching and unique challenges we face, not this week or this year, but in the 21st century? As funders, we can’t escape these questions. Knowingly or not, everything we do is an implicit response to them. Every time we make a grant or fund a project, we should think: how is this program responding to the challenge of being Jewish in a world of free choice? How does the program define Jewishness and community? What vision of society does it advance? To what end does it use our community’s power? We can mobilize our collective resources to build a Jewish world that is vibrant, relevant and meaningful; that sees beyond the hatred of hyper-tribalism and the cultural starvation of hyper-cosmopolitanism; a community in which Judaism is not a relic of the past but a response to humanity’s most pressing challenges. As funders, we have that power and that obligation. 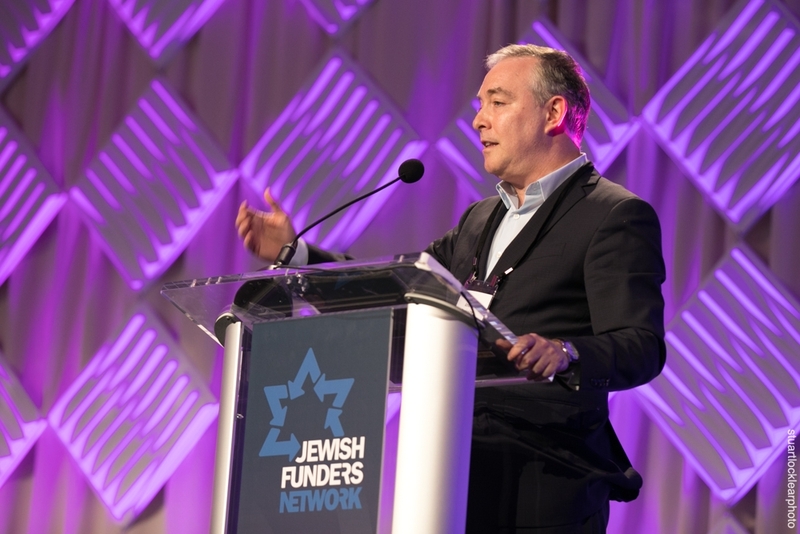 Time at the JFN conference was devoted to recognizing some important departures from Jewish philanthropy, including that of the Avi Chai Foundation, which is concluding a several-years-long process of sunsetting at the end of this year. Bernstein is the widow of Zalman Bernstein, who was known in the finance world as Sanford Bernstein and founded the investment firm that bears his name—now known as Alliance Bernstein. He died in 1999, after turning to Orthodox observance in the 1980s and dropping Sanford for his Hebrew name, Zalman. The JFN conference also looked toward the future, with a special track dedicated to young funders and a prize given to David Rittberg, who directs the Charles and Lynn Schusterman Family Foundation’s U.S. grantmaking portfolio. He was awarded the JJ Greenberg Memorial Award, which is named for a son of notable modern Orthodox community leaders Blu and Rabbi Yitz Greenberg. JJ Greenberg was killed at just 36 in a bicycle accident in Jerusalem on the eve of Yom Kippur in 2002, where he was visiting two of his four siblings and their children. Greenberg was on the staff of Michael Steinhardt’s Jewish Life Network, where he worked with his father. JFN gives the award annually to a foundation professional under age 40 who has demonstrated extraordinary leadership in Jewish philanthropy. That award wasn’t the only attention paid to the future Jewish community; a session was devoted to a new study of Jewish teenagers conducted by the Jewish Education Project, a New York City-based organization. Slated for release in June, the report will be titled “GenZ Now: Understanding and Connecting With Jewish Teens Today.” Researchers worked with 14 national youth-serving Jewish organizations to survey nearly 18,000 Jewish adolescents ranging in age from 13 to 19. A special report titled “Young Adults at Risk in Israel” was also commissioned by JFN. It is part of the organization’s series of “guides to intelligent giving,” which provide background, context, a field survey of what is currently available to aid young Israelis, and recommendations for best practices. Previous Greenbooks, which are produced annually, have looked at Jewish day school financial sustainability and affordability, the funding of Jewish overnight camps and the arts as a driver of social change in Israel. A Unique Prize Taps Jewish Wisdom to Defend Democracy. Who Are the Winners? What's the Deal With This Real Estate Billionaire's Philanthropy?